My card today is “Birdbrain Snowman” colored with Copic Markers. I stamped the background snowflakes by Clearly Besotted in Versamark. The pattern paper is Fancy Pants. I finished off with glitter pen. It’s the fifth Wednesday of the Month and time for The House That Stamps Built Anything Goes challenge. This doesn’t come around too often, but it’s your time to do anything you wish. You have until Tuesday, January 5th to enter for a chance to win a $25.00 gift certificate at Repeat Impressions. For my card today I wanted to showcase a quiet winter scene. I started by stamping the Repeat Impressions “Home For The Holidays 304-N” with Versafine Black Onyx Ink, watercolored the image with my Zig Clean Color Real Brush Markers, and added the “Love Much 3110-F” sentiment. To finish the card I added some ink splatter and cut out the panel with a Lawn Fawn stitched rectangle die! Hello Clowdies. Here is the finished project from Kit & Clowder Create & Learn for December using East Wind’s Auroa Harbour Bridge. Alyce, the owner of Kit & Clowder is one of the best teachers and if you haven’t tried one of her classes I strongly encourage you to do so. Other than the blending on her shawl, which I just couldn’t get to work, I’m happy with this image. Merry Christmas friends!! It’s Friday and time for another post featuring the Angels Showcase by A Day For Daisies. We are also still having the “add pearls” challenge over at the blog through Thursday, December 31st so we hope you’ll come on over to enter. For today’s card, I used “Rose Angel” which I colored with Copic Markers. I created a circle card using My Favorite Things dies and added some gold ribbon and beautiful pearls to add a little bling. We can’t wait to see what your “add pearls” entry looks like using your A Day For Daisies Images. Please also visit our Facebook Community Page as we’d love to see your cards there too! I used the inspiration from Julie’s past Make it Monday using the Brushstroke Christmas. I also used Mistletoe & Holly stamp and dies stamping them with gold embossing powder and watercoloring with Distress Markers. The background is We R Memory Keepers Basketweave folder cut from My Favorite Things Brushed Gold Metallic paper. A Blog Named Hero -Announcement!!! Pinch me now. I am so thrilled to have been chosen as a Design Team member at A Blog Named Hero for 2016. I have long been a huge fan of Hero Arts and am beyond excited to work on this talented team. I’d love it if you checked out the announcement over at the blog and join up as a member so you can come and play with us. This blog has fantastic sponsors offering great prizes. Starting in 2016, I’ll also be using inlinkz for the supplies used on my cards and would really appreciate it if you use the links to make your purchases to support the team. For the announcement, I prepared a Hello card for you using Wreath of Leaves, Tree Bird n’ Message, Thinking of You, and Everyday Sayings, all Hero Arts Stamps. I finished off with sequins, white enamel, and stickles. I colored my bird with Zig Clean Color Real Brush Markers. Christmas is almost here Junkies and today I’ve got a little holiday inspiration for you. I hope you get a chance to get inky this holiday week, I know I will. For my card I began by stamping “Christmas Tree, Set of 6” with Flitterglu and applied Indigo Blu Mega Flake in Chariots of Faire and Winter Dawn. I did the same process with the fabulous “Snowflakes” stamp then sprayed it all with “Gilded Gold” Fairy Dust by Art Anthology. For my card base I created an interlocking die background by cutting a flag die out of Silver and Gold pattern paper then lined them up to create a fun background. This is a take on the Herringbone background that I learned by Shari Carroll. For my sentiment I used the Tim Holtz Holiday words “noel” die. We here at Technique Junkies wish each and every one of you and your families the most wonderful holidays and look forward to showing you the great new release coming on January 1st! Hello friends! Happy Monday! I’m here with this weeks sketch challenge at From The Heart Stamps. This is our last challenge of the year as we are taking a break for the rest of the year. These are great challenges because you can use just the sketch, or if you’d like, add the twist. The only requirement is that you use a From The Heart image – the rest is up to you. The twist for this challenge is to distress edges. You have have until Sunday, January 3rd to enter this challenge at From The Heart Stamps. Can’t wait to see you there!! For today’s card I used a Rhonda Designs Digital Image called, “Snow Heart.” I colored him with Copic Markers and cut it out with a scalloped Lifestyle Crafts Die. The background was created using the My Favorite Things background builder and the sentiment is from PaperTrey Ink. 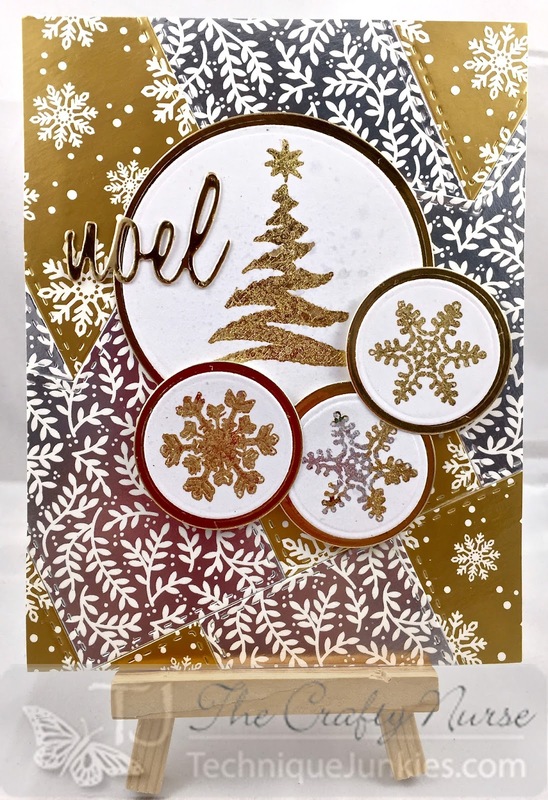 Hope you join us at Cards in Envy for our Let It Snow challenge! For my first card uses the “Rubbed Gelato’s Technique from the Artistic Effects CD in rainbow order after I white heat emboss my image. I then used the Lawn Fawn Stitched border dies to create faux stitching to separate my colors. My second card uses the “Pearlized Gelato’s Technique” also from the Artistic Effects CD. I dripped the gelato’s mixed with perfect pears off the top of the card base then sprayed with water and allowed to dry. I love how this one came out. I hope you are finding some time to get inky today even if it is a week before Christmas!! Also, I can’t wait to show you the new January Release for Technique Junkies with the much anticipated Blog Hop on January 1st.